Why would anyone Cycle the Nullarbor ?? Cycling the Nullarbor is a challenge that has exercised the minds and then the bodies of many cyclists over the years and continues to do so. It was first cycled way back in 1896 by a 24 year old — Arthur Richardson. He rode from Coolgardie to Adelaide following the telegraph line. Took him 31 days and it must have been a real tough trip. Plenty of cyclists still continue to rise to the challenge and looking at the web you can get some great stories of how this journey panned out for them. For some a “spiritual journey” for others a way to highlight a cause or raise money for a charity , for others just a great adventure in the outback that they relished and look back on fondly – for others a right royal pain in the arse trip where headwinds made nearly everyday a trial and in all a totally boring experience not to be repeated. Wind is a major factor and dead straight roads and headwinds that may blow from the same direction for days on end may make it a horror trip for those unlucky ones to get timing or direction wrong. Could be a case of ” a prophet is without honour in his own country” ie maybe non Australians appreciate the ride for the special character and unique nature of the long straight roads in the desert – not common elsewhere in the world. If NZ is the ” land of the long white cloud” this part of Australia is the land of the long straight road. 3. Plenty of free camping opportunities right across particularly if the budget does not extend to staying in the roadhouse motels etc. 4. Lots of interesting bird life – great sea vistas – and little things that your average Joe Blow motorist misses from inside the car as they cruise thru at 100 clicks . You experience the ride thought ALL your senses. 5. the memories of a cycle trip like this become permanently etched on the hard drive of your mind and remain with uncommon clarity years after the event. This is particularly true for solo cyclists. 6. Lots of “true blue dinky di ” Aussy grey nomads to talk to as they undertake their own pilgrimage with their caravans- no shortage of human contact at every roadhouse along the way. 7. 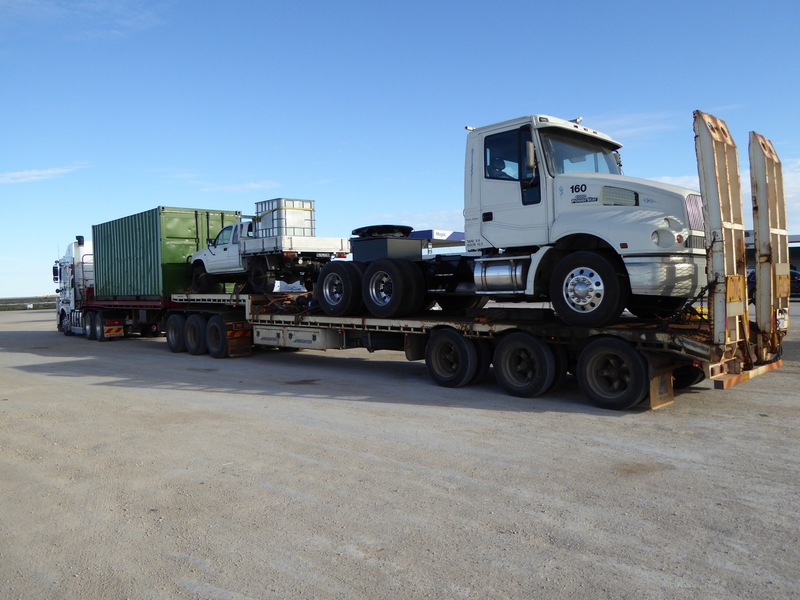 The road train traffic is very well behaved and will invariably pass on the opposite side of the road , wherever possible , giving you maximum space. think the Aussies have a demerit system for misdemeanors – like killing cyclists. The heavy vehicle traffic is safer here than at home. Well that’s just 7 reasons – but Seven is a perfect number. Ah forgot one other positive – impossible to get lost ! Got to meet Peter Lamond and his son Simon who have been cycling in the opposite direction. Tough guys – camping all the way fighting against some horrible headwinds too. While I was having a great day yesterday being pushed effortlessly towards Nullarbor these two were battling into this savage headwinds. We swapped yarns and told a few lies . 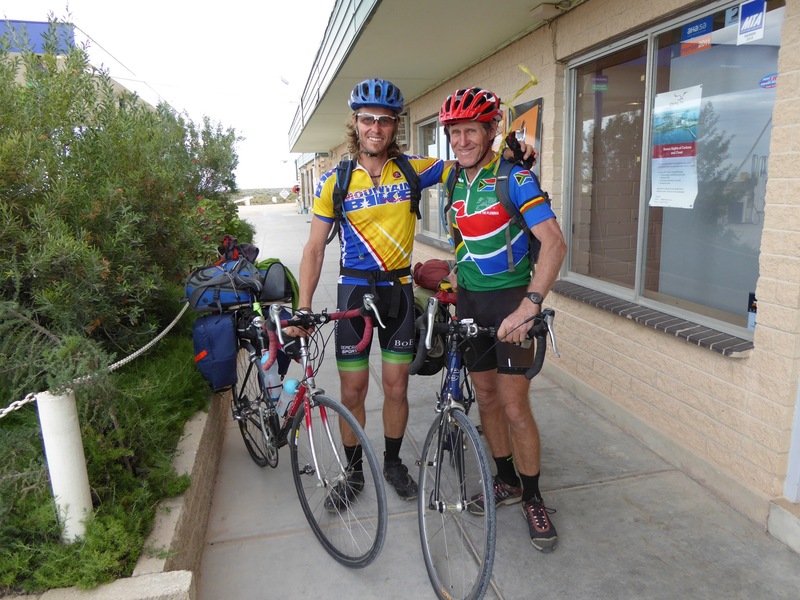 Peter is South African his son now Canadian and Peter has had a lifelong passion for exploring the world via the bike.